This lovely simple tangle pattern, Ballace, is another contribution by Taiwan quilter and tangler Mei Hua Teng, aka Damy. This is an easy and versatile ribbon-like tangle to use in your Zentangle® art. Damy writes that she was randomly drawing patterns and the result reminded her of “a pretty lace”. Ballace also lends itself to many variations and here’s one very simple example with an aura and a bit of fill. Damy illustrates the step-by-step instructions for drawing Ballace here and features it below with auras, orbs and Beadlines in a beautiful completed Zentangle. 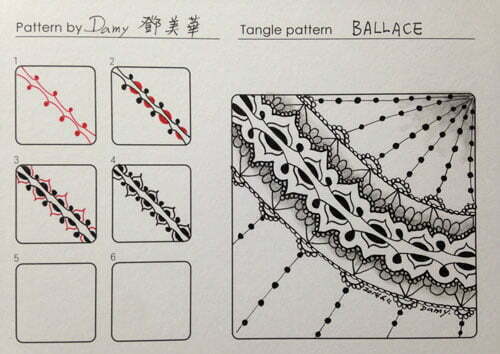 I’ve noticed some Zentangle newbies describing their drawings containing several patterns as “a tangle”. Not so. A tangle is a pattern — one (1) single pattern. Hi Damy, For one who does not go for the line patterns must admit I really like Ballace, ‘cos it can be stretched outwards as in your beautiful completed example. Already my mind is in a buzz to use it in my next Zentangle artwork. Many thanks for sharing and hope to see more of your work. Peggie Schurch Aust. This comment does NOT apply to Ballace. It’s more about what I’ve seen on the Internet at large and Linda’s comment about terminology. People seem to be forgetting that Zentangles are not representational. Which is not say people shouldn’t make their lovely drawings — they just should call them drawings instead of Zentangles. Terminology is everything. One does not call a “tendon”/one of those stringy things. To say “drawing” is to deny the artist. Every artist has their own unique technique, everything they draw catches a person’s eye and they know it was drawn by that particular artist. Zentangle may be drawing, but it is more. Zentangle is a door through which one may enter and, artist or not, a beginner learns techniques, composition of (oneself through the Zen) as well as self-discovery. It is an element of empowerment to those who feel they “cannot draw”. This is a gracious gift from two remarkable people. With Zentangle I learn what high-brow teachers cannot teach: the urge to try again. It shuts the interior critic up and brings out the child who leans over my shoulder and watches without comment. This is not stasis, but action without movement; ZEN.